Anymore, I only make custom cake plates exclusively for Pink Olive stores located in East Village and Brooklyn. This latest batch is my favorite batch yet….steamboats, a cabin in the woods, 4th of July stars, retro star bursts, and grains of wheat. I have one more batch to make and add to these, and then they will be on their way to NYC! It has been fun to work on this plate collection this week, and I had two commission pieces come in this week that are going to be beauties! 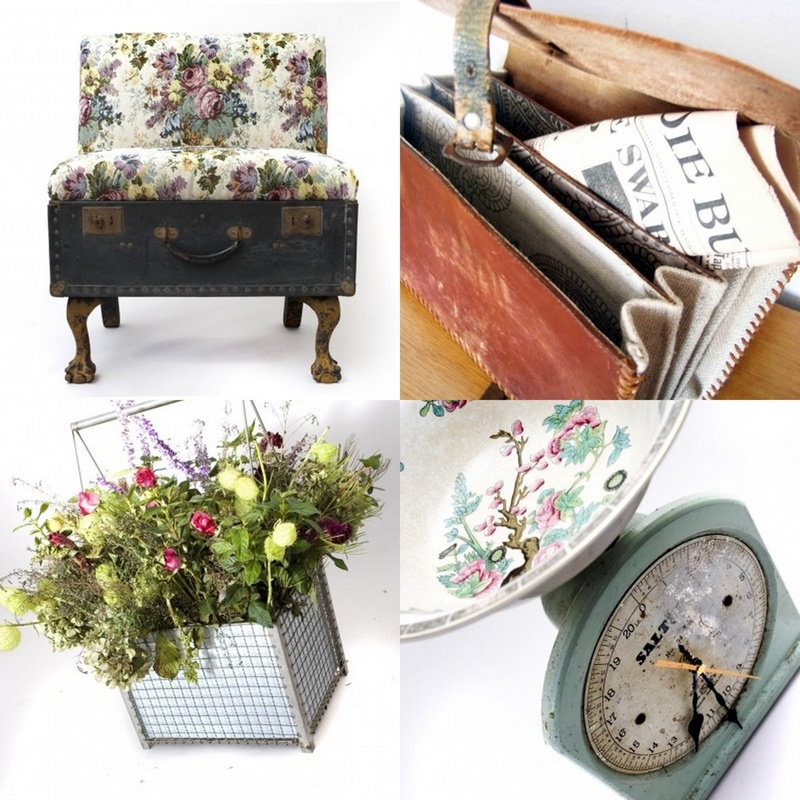 Can’t wait to reveal the furniture makeovers! 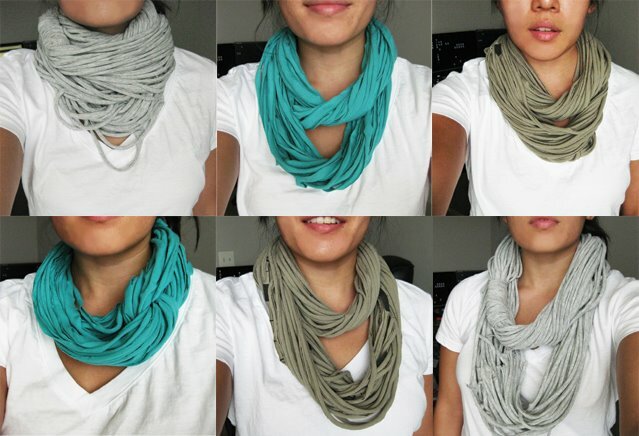 Sooooo, when I was directed to this super easy tutorial while visiting my friend Brooke’s blog….I thought I would give it a try….because these t shirt scarves are that fantastic! 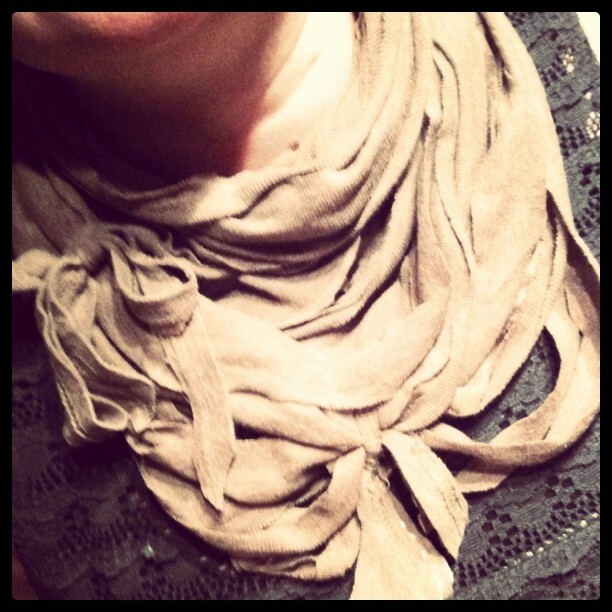 Mine turned out a little “scrappier” since my t shirt of choice was not a stretch cotton t shirt, and I decided to use scraps to tie off random places….. but I love the scrappy, messy, free, organic result as well! ……now off to buy some more t shirts. Whatcha think of me now?! Try it ….you’ll love it, and it takes all of five seconds! Hello Knack’s friends! I am Fiona of Fee-AMore. I am happy to be guesting over here while Barb is out of town…. Perhaps you might or might not have heard of Katie Thompson of REcreate. I remembered i came across Katie Thompson quite sometime back and was absolutely amazed by her recreation of furniture, lighting and many other household accessories. Katie loves discovering the extra ordinary from the ordinary. 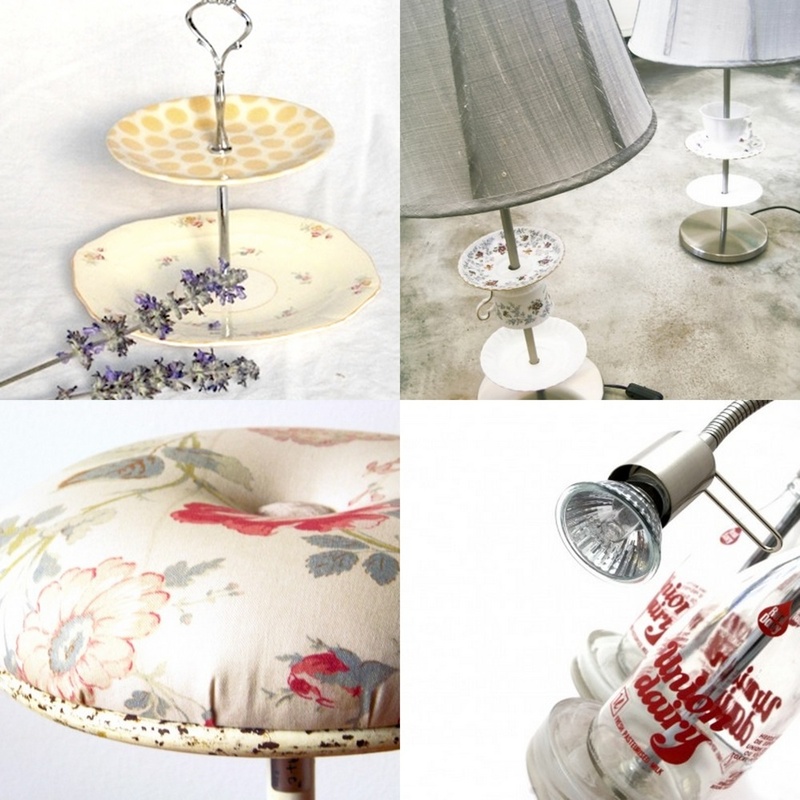 From old suitcases redesigned to become chairs, old broken kitchen scales recreated as clocks, dinnerware transformed to cake stands, milk bottles and china tea sets turned into lamps, are just some of her many amazing, lovely recreations. From old to new, useless to functional, Katie certainly gave them each a life with a function. I absolutely enjoy Katie’s style and her cutting edge interior design. I hope you do too! And thanks for having me over, Barb!